Viviane Sassen’s work has many faces. It is by turns beautiful and disorientating, characterised by an aesthetic which operates way beyond the traditional confines of a single medium. Accurately described as a creative polymath, Sassen’s skill-set spans performance, photography and installation as well as design, collage, and fashion, her imagery is as expansive as it is immersive, with an unquantifiable reach. Ahead of the book’s release this month, we speak to Danset and Sassen – who also photographed Dazed’s Spring/Summer 2017 cover stars Alek Wek and Grace Bol – about their shared vision and their fluid sense of self. Roxane Danset: We met in the spring of 2009. Our first meeting was on set and it had the potential to be a very stressful job – I had just lost my suitcase on a flight and Viviane was managing a menswear fashion shoot, actually, she was flitting between a handful of shoots at the time. However, it wasn’t stressful at all and this level of balance we found that day – amidst the chaos – has stayed with us throughout the course of our relationship. 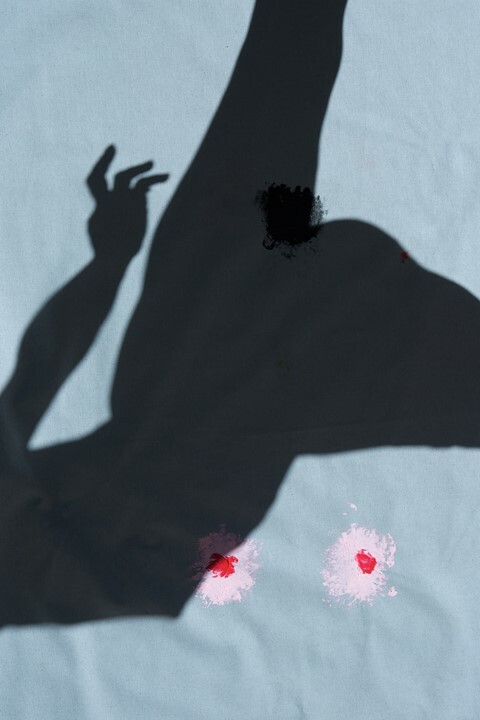 Viviane Sassen: Yes! We met for the first time on a shoot in Tenerife, on the windy mountain of El Teide. I had never met Roxane before and I was instantly blown away by her presence. I thought she looked like a movie star – she’s such a classic beauty. There’s something very elegant and at the same time very modern about Roxane. I guess she reflects the kind of woman I would like to be, but quite frankly never will be: cool, fearless smart and with the kindest heart! How would you describe the differences and the similarities that exist between Roxane and Roxane II? Roxane Danset: Well they compare in the sense that Viviane is the photographer and I am the subject. When I look back at Roxane I, I see myself as a young woman searching for something… I was still looking for so much, for my place in the world, in work, in love, in family, and in art. For Roxane II, six years later, so many of these questions had been answered. Roxane II is different, she’s confident and she’s fierce! Viviane and I – I feel – painted motherhood. It felt like the right time to open up a necessary dialogue and to depict what it feels like to be a wife, a professional and an artist – as separate entities and all at once. And the differences, well you know, six years ago when we were working on our first book, Viviane asked me whether I would pose naked. I called her back in 2016 and told her... yes, I will now! There are so many ideas and photographs exploring this concept of femininity and the body, but very little of which we collectively seem to be able to relate to. Roxane and Roxane II put very plainly, is about two women exploring their friendship through an artistic collaboration and a shared, single vision – womanhood. Viviane Sassen: Roxane I investigates what it means to be ‘female’ and Roxane II stretches these concepts further. Our collaboration is all about mutual trust. Once we get ourselves into this habit, this ‘place’ where we are able to create images together, it’s a never-ending flow of creative ideas and experimentation. There is no structure with us and that’s the beauty of it. Roxane brings me to an unknown territory, and I believe I do the same for her. Together, we explore untouched space for the first time. I mean it helps because we are both preoccupied with the female gaze. We want to create images of women that explore the psychology of collaboration and inclusivity. To cherish the female body and mind with all its imperfections, that’s really important to both of us. What is keeping your fascination with each other steadfast? Viviane Sassen: Roxane always surprises me. She has an unshakeable air of mystery about her. Photographing her is so great because she is the definition of versatility. It seems to me that she can reflect many different archetypes within one personality: the goddess, the wise mother, the sexual Venus, the innocent and playful child and more. Roxane Danset: She is my muse! My fascination with Viviane comes down to her comfort and sheer kindness. She has a singular vision and aim: to explore the way our bodies exist in the natural world, in their most truest forms and I believe in that vision wholeheartedly. Viviane will only ever produce a piece of work that she believes to be relevant, never ever because someone else expects it of her – and I admire that. Again, it’s the singularity of her unique vision. “When I take a glance at our selves I hold my breath and see us expand in colours and clouds bursting from a mouth. Are they yours or mine?” These words set the tone in Roxane II’s introductory pages, how do you interpret this poetic piece? Roxane Danset: These words bring me right the way back to the beginning of our relationship. They make me remember the very first moment we started to bounce references back and forth, back and forth to each other and then suddenly the fantasy became one. We talk to each other on a higher level and I only speak to her from that perspective. We are both the participants, together we make the picture, it is not just someone pointing the camera at the other. Viviane Sassen: For me, it epitomises the excitement and the joy I still feel when working with Roxane. You know, it’s like, how can I put it... the juvenile memories of losing yourself completely in a game and when you eventually win, you are bursting with happiness oblivious to the fact your feet are sore and you’re thirsty as hell! Do you believe your combined sense of self is an amalgamation? And has your sense of self changed between Roxane and Roxane II? Viviane Sassen: I feel that most of my work is about love and loss. It is about fear and longing. The idea of merging with the ‘Other’ in whatever sense, is also very important to me and this has always taken prominence in my work. Roxane and I have a mutual sense of understanding and of trust. The nudes in the book are a testament to that, they were the next logical step in our attempt to expose ourselves to the fullest. But of course, Roxane is the brave one here, as she is the one being exposed in the most literal sense and then I metaphorically suggest the presence of ‘another’ through marks of paint, shadow, and graphic overlays. Still, I had to earn that trust by giving Roxane myself as well. We are in balance. Roxane Danset: I see our selves as cats, we follow each other where it feels good, we feel each other purring and we keep exploring the territory we are at, always together. Can you tell us a little bit about the technicalities behind the images? How did you capture this shared sense of self in your different roles? Viviane Sassen: It was a very fluid process of working. To choose the right angles, to direct, to listen and to allow yourself to be surprised by what happens in front of your eyes – don’t draw your conclusions too quickly. Roxane Danset: You know, it is funny but when I step into a project with Viviane, whether book, art, editorial etc. I do not approach it as a model, ever. I always approach it as a stylist and in a very editorial capacity. I research clothes and prepare looks, even if at the end of the day we decide not to feature them. There is always a huge wardrobe room with epic pieces around us! Will there be another book, where will that take us? Viviane Sassen: Only the future knows. Roxane Danset: All I can say is I miss her when she is not around and I am totally addicted and excited about our shared vision of beauty!